October 9, 2018, 6 p.m. Pull out your Red Shoes and join us for LIVE music, shopping local vendors, a Silent Auction and great food with friends, colleagues and local supporters of DASI. 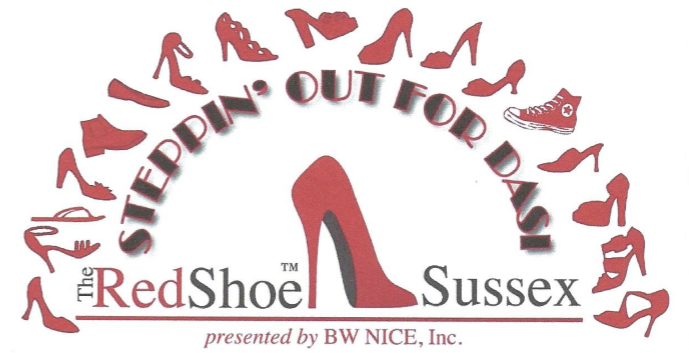 The Red Shoe™ Sussex is the Chapter’s annual charity fundraising gala supporting BW NICE, Inc. and our local charity partner, DASI. It is an evening to celebrate all women in business and make a difference in the lives of those in need. This event helps raise public awareness and funds to support the immediate needs of the women and children in local safe and transition housing while helping them gain dignity and hope for a new and better life. At The Red Shoe™ Sussex event, you will enjoy an evening of networking, shopping among local vendors, a fabulous buffet and cash bar, as well as LIVE music from local musicians! We also honor a Businesswoman of the Year, someone who inspires us with her leadership, energy, concern for others and commitment to business and community. The name for this event, The Red Shoe™, came from the BW NICE logo. It symbolizes unity, strength, and empowerment as women come together for a common cause and “raise” awareness within our communities. It’s time to reserve your seats to meet the local vendors and find that special silent auction item!! Gather your friends and come and join us for a fun evening with LIVE Music, Impact Speaker, and Shopping Extravaganza at the beautiful Lake Mohawk Country Club. Information about our cause. Includes all forms below. Submit your nomination for Businesswoman of the Year. Learn how to advertise in the Red Shoe Event Program. Support the Red Shoe event by becoming a Sponsor. Participate in the Red Shoe event. Sign up for a Vendor’s table. Purchase a ticket or a table. Donate a basket or your services.